Usage: Get the serum entirely at the bottom of the ampule. Break the serum ampoule using a tissue paper or textile towel. Make sure you hold the ampoule standing before breaking it, to avoid spilling the product. Markastore tip: Apply in humid conditions. If it is used in a dry climate or atmosphere it can dehydrate the skin as it draws the lack of moisture to the skin. 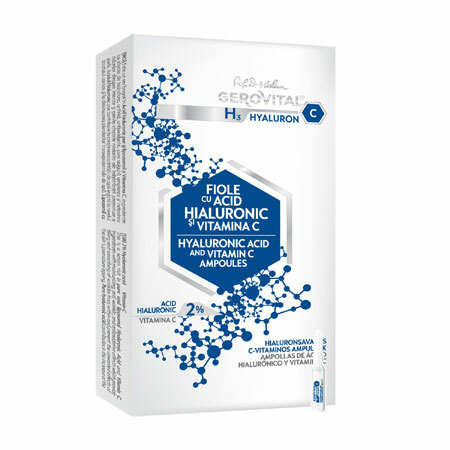 When applied in a humid environment, the Hyaluronic Acid will draw moisture from the air rather than deeper layers of the skin. Seal in the moisture immediately with your serum or moisturizer. INGREDIENTS: AQUA, GLYCERIN, PROPANEDIOL, LECITHIN, SODIUM HYALURONATE, CHONDRUS CRISPUS EXTRACT, CARBOMER, PHENOXYETHANOL, ETHYLHEXYLGLYCERIN, PPG-26-BUTETH-26, PEG-40 HYDROGENATED CASTOR OIL, 3-O-ETHYL ASCORBIC ACID, SODIUM CITRATE, CITRIC ACID.